At your request, we have provided a report that we prepared regarding the Mucha Property at 2558 South Shore Drive, which is located less than 400 feet from the McIntosh house. ..
Mr. Mucha…stated that he saw the garage blow apart before 9:00 AM on August 29, 2005. This garage landed in the street in front of the house. 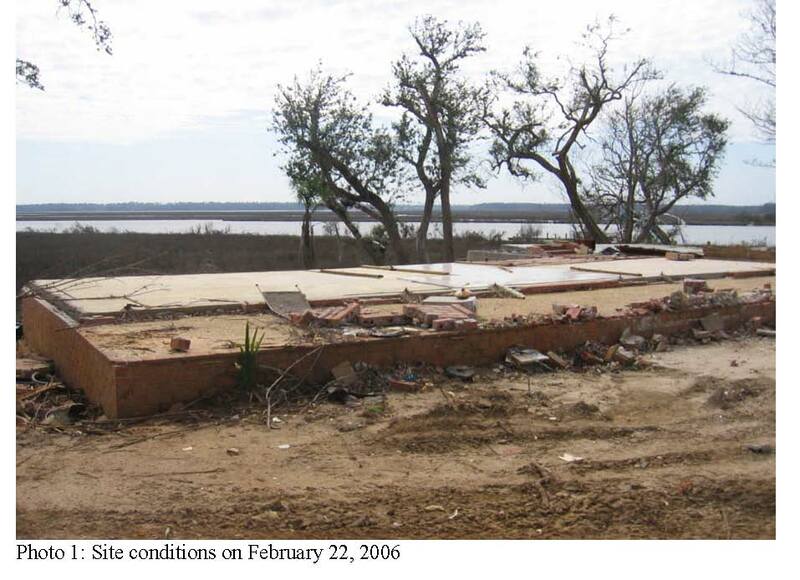 The disclosures of the Rigsbys’ expert witnesses included the post-Katrina engineer’s report on the Mucha residence prepared by John A Fowler PE, President of Fowler Engineering. There is over 1,000 feet of unobstructed open marsh behind the house which leaves a very large unobstructed path with for wind to come across the marsh from the south and southeast during a storm and damage the house. This is probably the reason why the Mucha house was destroyed by wind and some of the neighbors’ houses were not. The neighbors’ houses did not have an unobstructed path between their house and Hurricane Katrina as the Mucha’s did. With the Mucha’s house standing for some period of time before it was totally destroyed during Hurricane Katrina, it shielded the other houses in the neighborhood. The other houses in the neighborhood are also at varying angles to one another and shield each other, but this is not the case with the Mucha’s house. With engineering reports like this replaced with one claiming flood damage, State Farm was unable to keep the whistleblowing Risby sisters down on the Farm. Qui Tam Olymics – Defendants’ games pit Judge Vance (Branch) against Judge Senter (Rigsby) introduced the interplay between the Rigsby and Branch qui tam defendants. The name of the Olympic event currently taking place in Judge Senter’s Mississippi courtroom is the Protection Game – State Farm hardball versus the Rigsby sisters. The next post in this series will cover the protection game going on in ex rel Branch over in Louisiana before Judge Vance – hopefully by then I’ll have mastered whatever trick is needed for the slides to run as a show! 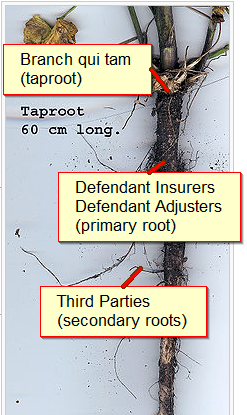 A post on Insurance Law Hawaii (h/t CLS) sent me racing to the Branch qui tam docket thinking I’d missed an Order more recent than those I linked in taproot – digging out the fact on Branch qui tam. As it turned out, I had not. Sop posted Judge Vance’s 69-page Order of October 19 in Judge Sarah Vance Educates Insurers about Federal Court Jurisdiction in False Claims Act Cases that I linked in taproot. However, while SLABBED focused on the big picture of Judge Vance’s ruling; i.e., Branch was moving forward, Tred Eyerly, the attorney who writes Insurance Law Hawaii, pointed to the ruling of Branch Consultants qualified as an “original source” – a ruling the Defendant are challenging in their Motion for Certification of an Interlocutory Appeal. Taproots develop from the radicle of the seed, which forms the primary root. It produces branches called the secondary roots, and they in turn produce branches to form tertiary roots…very difficult to uproot – the plant itself gives way, but the root stays in the ground and may sprout again. Who better than Judge Sarah Vance to do the digging and get to the fact of the Branch Consultants qui tam claim? None that I can think of considering the depth of research evident in the Order that Sop reported in Judge Sarah Vance Educates Insurers about Federal Court Jurisdiction in False Claims Act Cases – A Branch Qui Tam Update. Relying on pre-Rockwell out-of-circuit decisions, this Court has reached a different conclusion, finding that Branch’s investigation of a publicly disclosed fraud provides direct and independent knowledge such that Branch is an “original source” whose allegations provide this Court subject matter jurisdiction. It is this question Defendants seek to have certified for interlocutory appeal: whether a “sleuth” like Branch, without first-hand involvement in an alleged fraud, can qualify as an “original source” by providing additional examples of a publicly disclosed, alleged fraudulent scheme. SLABBED has been talking about the Maustaud directive on expedited claim handling process. Like most good conversations, one thing led to another – and the most recent “another” was a discussion of the relative merits of the qui tam claims filed by the Rigsby sisters and the Branch consultants. The last SLABBED update on Branch – Support for Rigsby qui tam found hanging on the Branch qui tam docket – reported Judge Vance had requested the parties submit an order for preservation of documents. The content of that post as well as that of a more recent post on an order issued by Judge Vance – Federal District Court Judge offers tutorial – proof of loss and segregation of damages – is relevant to the ongoing conversation about the Maustaud directive. The fact that FIA and the WYO carriers enter into an agreement, and the agreement relates to the WYO carriers’ alleged violation of the FCA, does not mean that the FCA claim is founded on that agreement. Rather, the FCA claim is founded on the defendants’ alleged violation of a federal statute which prohibits a person, like the defendants, from acting with appropriate scienter to submit false or fraudulent claims to the government or make false statements in order to avoid an obligation to the government. Further, the FCA provides for relief – treble damages and penalties – that is not available under the Arrangement but that arises instead by statute.